HONOLULU – The Hawaii Department of Transportation (HDOT) advises Oahu motorists that the westbound H-1 Freeway will be closed between the Makakilo Drive overpass and the Kalaeloa Boulevard overpass on Sunday night, Dec. 3, 2017 through Friday morning, Dec. 8, 2017 from 10 p.m. to 5 a.m., nightly. A full closure of the H-1 Freeway is necessary for crews to work on the Farrington Highway overpass as part of the Kapolei Interchange Complex, Phase 2 project. Additional full closures will be scheduled. 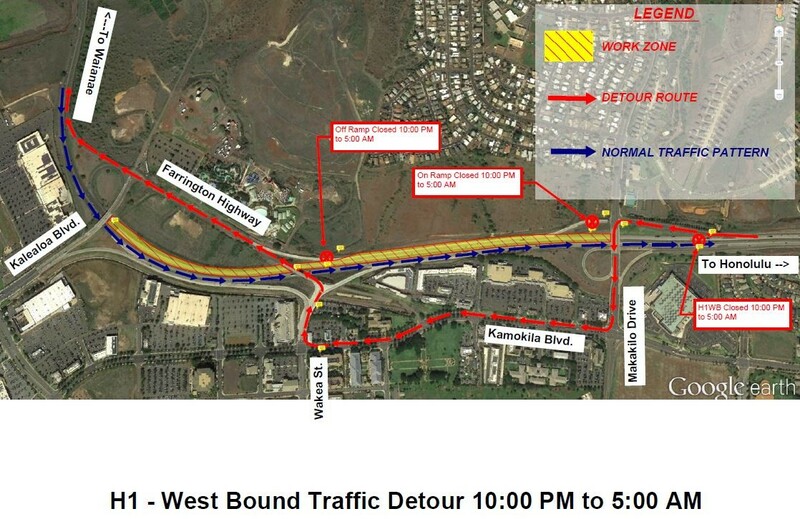 In addition to the full closure, a left lane will be closed on the H-1 Freeway in the westbound direction between the Makakilo Drive overpass and the Kalaeloa Boulevard overpass on Monday, Dec. 4, through Friday, Dec. 8, from 8:30 a.m. to 3 p.m.